“That ad actually shows the policies that Governor Rauner put in place,” Ives said of her now controversial campaign ad. Jeanne Ives discusses her platform with WWTW correspondent Paris Schutz in Ida Noyes Library. 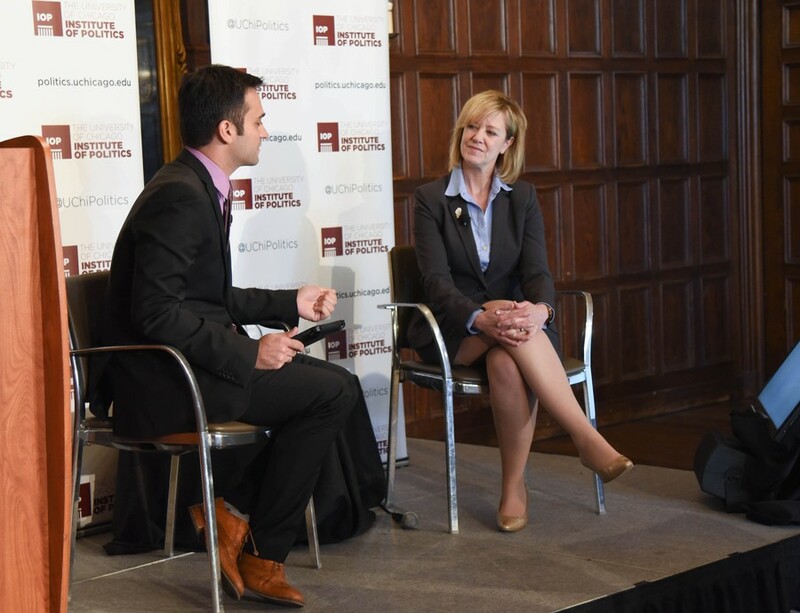 Illinois State Representative and gubernatorial candidate Jeanne Ives (R-42) outlined her platform and sharply criticized her opponent in the Republican primary, incumbent Governor Bruce Rauner, in a talk on campus on Monday afternoon. The event, hosted by the Institute of Politics, was moderated by Window to the World’s Paris Schutz. Ives was first elected to the Illinois House of Representatives in 2012, and represents a district that incudes Chicago suburbs Naperville, Wheaton, and Carol Stream. Ives called for an “austerity budget”, which would call for the state to delete grants and to reform Medicaid. She cited the state’s budget troubles as being the reason public college tuitions have increased. In addition, Ives stated that taxpayers should not need to pay for abortions and voiced her disapproval for HB 40, a bill expanding abortion coverage and signed by Rauner into law to expand abortion coverage. Schutz also brought up the topic of a controversial anti-Rauner ad Ives ran, which includes an actor portraying a transgender woman saying “Thank you for signing legislation that lets me use the girls’ bathroom.” The ad has been criticized as “racist” and “transphobic”. Schutz asked Ives asked whether she understood why some might have taken offense at it. During the event, Ives also detailed how her administration as Governor would be different from Rauner’s tenure in a series of responses to audience questions. She first called on Illinois House Speaker Michael Madigan, a Democrat, to resign, citing recent furor over his office’s handling of sexual misconduct claims as well as his management of state finances. Madigan has turned Illinois into a “fiscal basket case,” Ives said. In response to audience questions about her campaign plans, Ives criticized Rauner for influencing the election with his money, but remained optimistic about her campaign’s chances. “It’s an uphill battle...But we have a ground game, and we have people working for us every single day, and all he has is his checkbook,” she said. Despite her criticisms, Ives said she will vote for Rauner if he becomes the Republican nominee.